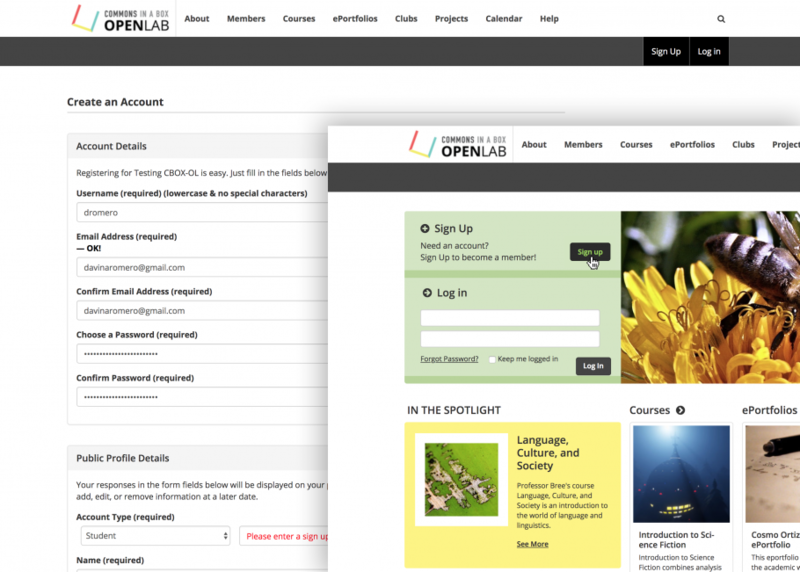 CBOX OpenLab has a clean, modern design. Site administrators can choose from three pre-set color schemes that are all accessible for users with visual impairments. Other aspects of the site design are also easily customizable, such as the logo, home page layout, and footer. The CBOX OpenLab home page provides a dynamic view of activity happening on the site. The most recently active groups are shown at the center of the page, along with the latest activity, new members, and who’s online. Site administrators can also communicate with site members via the spotlight and slider areas. 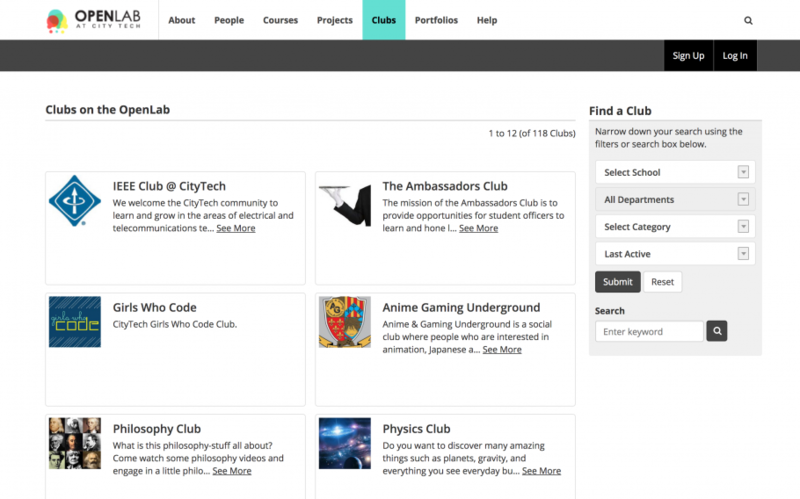 When CBOX OpenLab is first installed, it will show four types of groups on the home page: courses, projects, clubs, and portfolios. But site administrators can easily change this to meet the needs of their community: group types can be renamed, added, or deleted as required (see Groups & Group Types below). Account creation processes are straightforward and can be customized by the site administrator – for example, to restrict sign-up to people with a particular email address format (e.g. @mail.schoolname.edu) or a special sign-up code, and to display terms and conditions. People are at the heart of CBOX OpenLab. 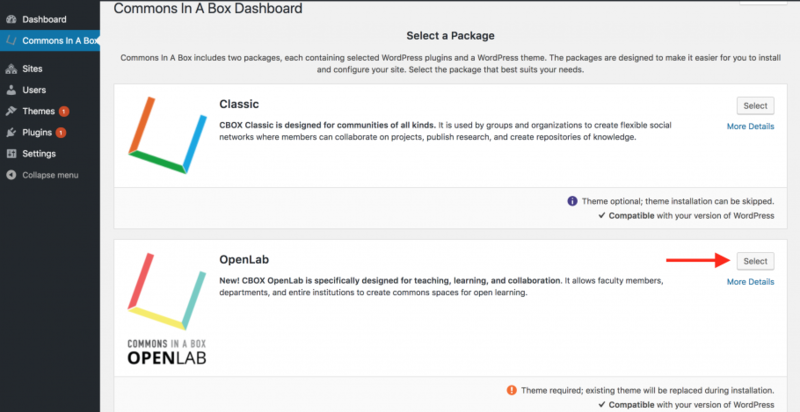 By default, CBOX OpenLab supports four types of members: students, faculty, staff, and alumni. Again, though, site administrators can change these as needed. The site has a member directory which can be searched and filtered in different ways, also customizable by the site administrator. Each member has a profile where they can share information about themselves; they are welcome to use pseudonyms for their username and display name, to protect their privacy. The profile also shows their activity, and links to their portfolio, if they have one (use of the portfolio feature is optional). 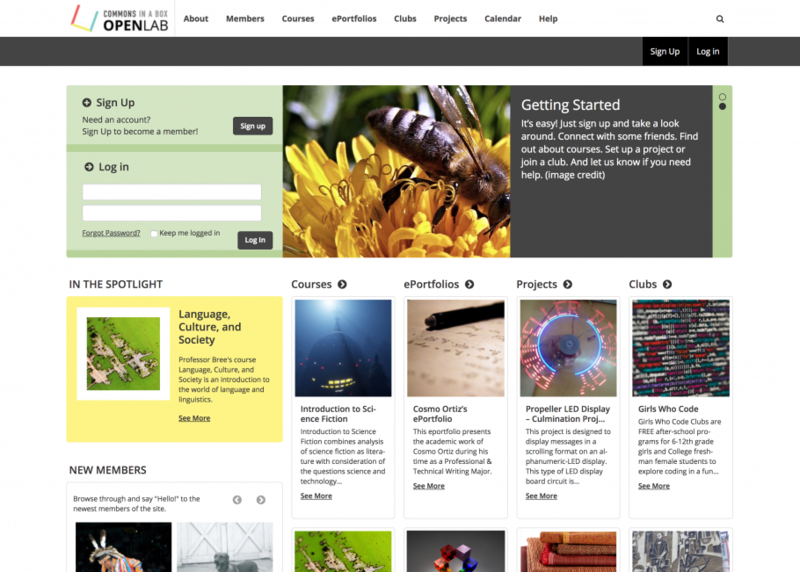 By default, CBOX OpenLab supports four types of groups: courses, projects, clubs, and portfolios. Site administrators can easily rename, add, or delete group types to meet the needs of their community (the site navigation will change automatically; a maximum of four group types is allowed). Groups can be assigned to different academic units such as Schools and Departments; these can be set up by the site administrator to meet the needs of your community. 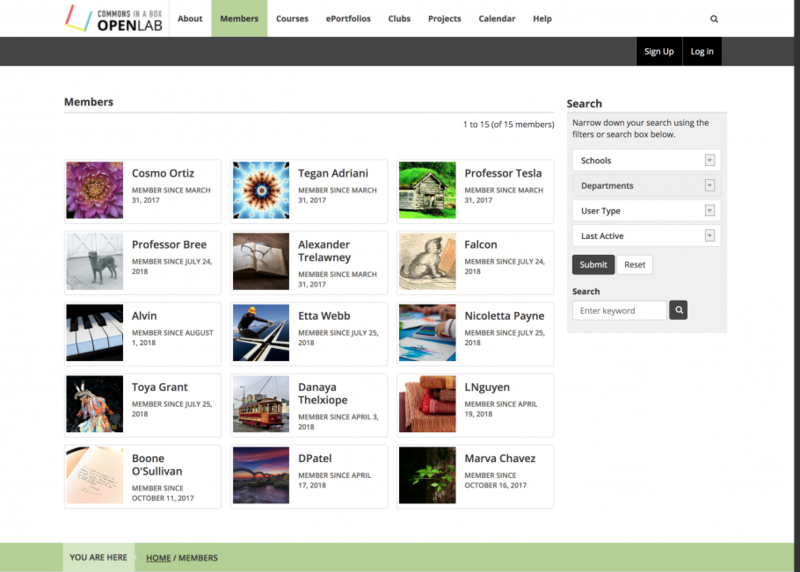 Groups can also be categorized in different ways; these are also configurable by the site administrator. 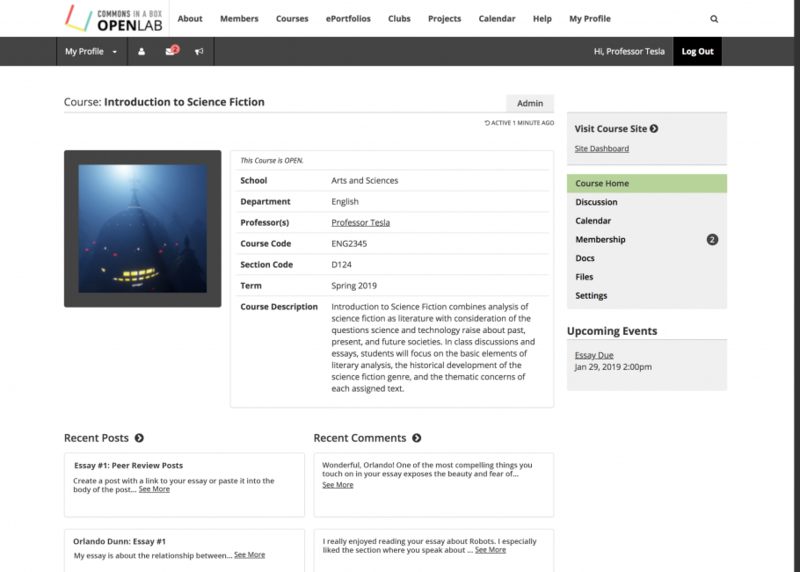 For instance, the site administrator could change the name of the “Course” group type to “Seminar” or, alternatively, create a category to enable courses to be identified as seminars. It’s easy for members to create groups, following a simple step-by-step process. 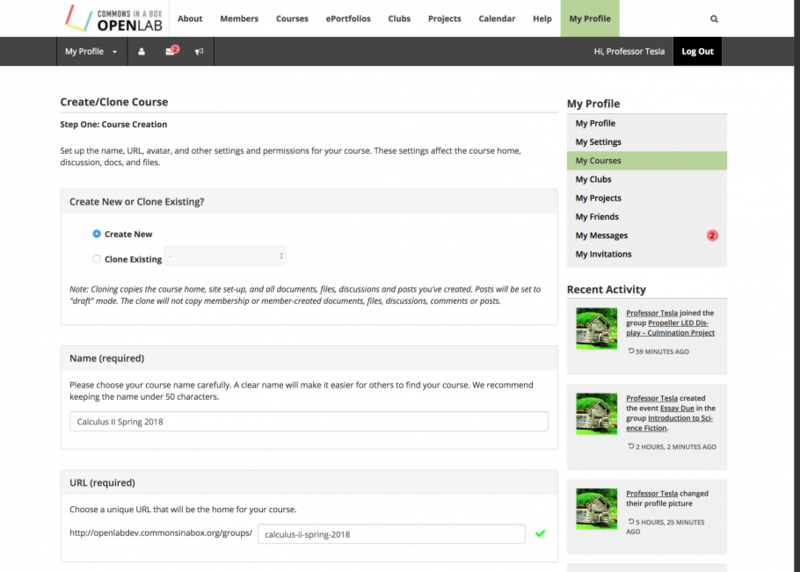 Courses have some special features: the ability to create them can be restricted to particular types of members (e.g. 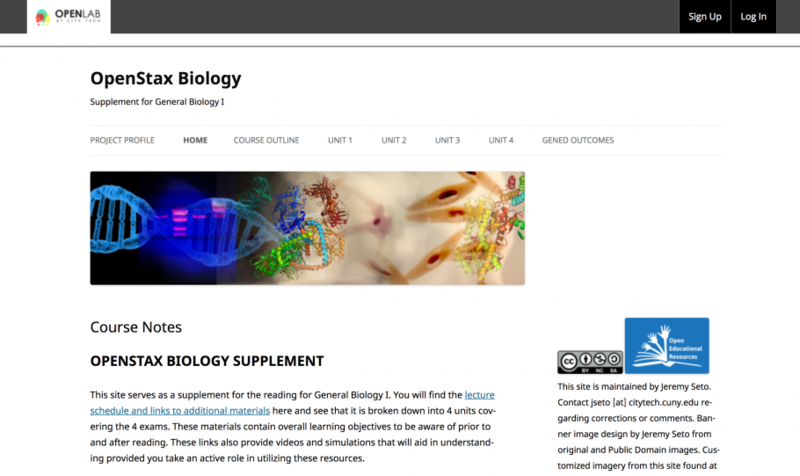 faculty), and they can be cloned, making it easy to reuse course materials from a previous semester. Portfolios also have unique characteristics: each member may have one portfolio, which the member creates and maintains via their profile; also, portfolios do not include the collaboration tools discussed below. With these exceptions, the different types of groups function consistently, making them easy to understand and use. Each group has a home page, which may include collaboration tools such as a discussion forum, file sharing, a calendar, and document editing. 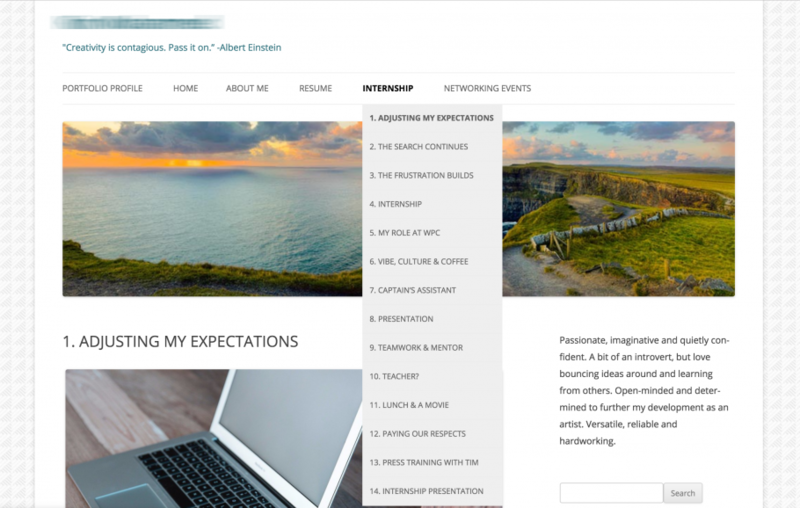 Each group can also have an associated WordPress site, providing members with easy access to powerful multimedia publishing capabilities. The site administrator can set up standard site templates for each type of group to promote good site organization. The home page and associated site can be public or private, depending on the needs of the group and its members – there are a wide range of privacy settings available. CBOX OpenLab is easy to install – see the Installation Guide for more details. CBOX OpenLab can be hosted through most popular hosting services, and Reclaim Hosting offers customized hosting services for CBOX that may be of interest to communities who want to get started with the platform. See the Technical Guide for more information. Site administration tasks are carried out via a user-friendly dashboard. 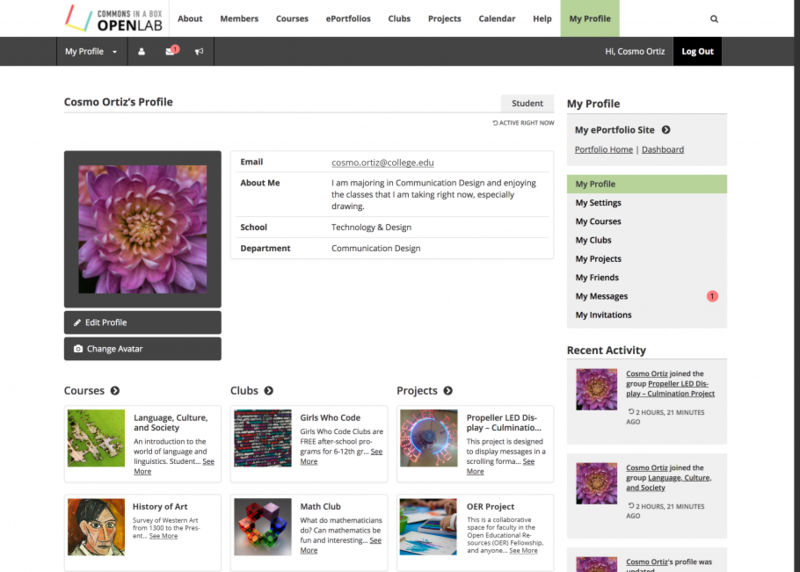 This allows administrators to customize the features and functionality of the site to meet the needs of their community. See Configuring CBOX OpenLab for detailed documentation. Below are some examples of how you might use CBOX OpenLab, drawn from City Tech’s OpenLab. At City Tech, the OpenLab has been adopted for courses across the disciplines, from Dental Hygiene to Hospitality Management, English to Entertainment Technology. 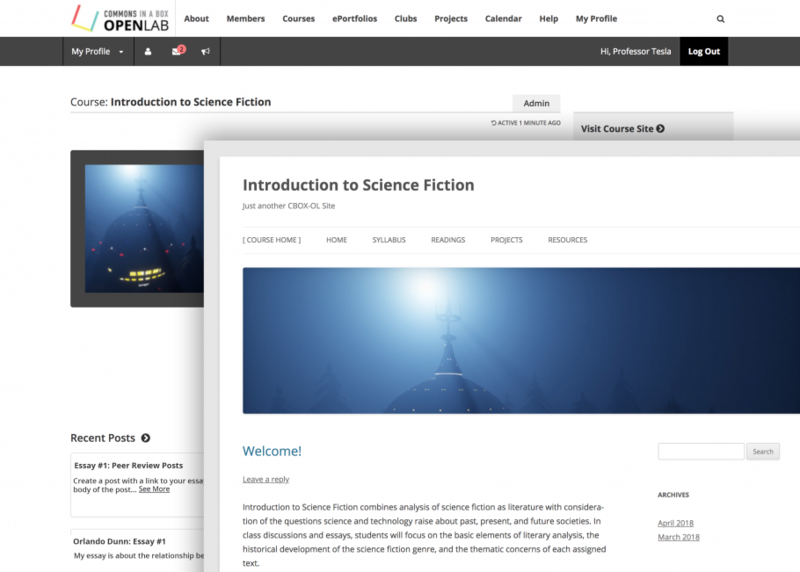 Hundreds of courses use the OpenLab each semester. 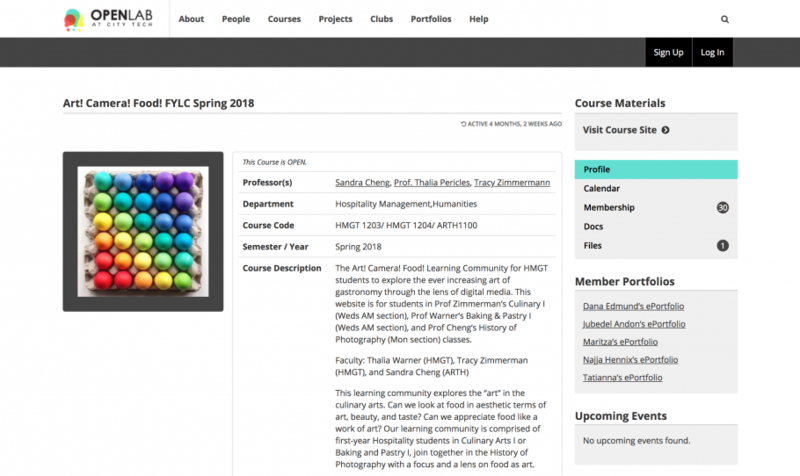 Faculty members can easily create a new course space for every class they teach using the course cloning feature, or use the same space over multiple semesters. They can even set up a shared space where students from different courses can work together, as in the example below, which is an interdisciplinary learning community. 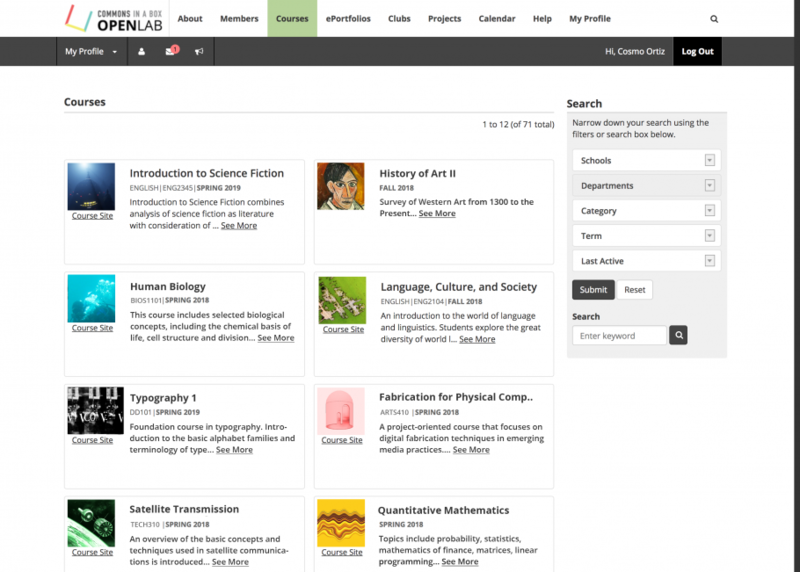 CBOX OpenLab is the ideal place to house Open Educational Resources (OER). City Tech has a robust OER Fellowship program, which supports faculty in the creation of OERs on the OpenLab. The OpenLab can also be used for all kinds of projects – student research projects, college committees, grant-funded initiatives, course coordination, departmental working groups, and much more. Members can also create shared spaces around their interests. 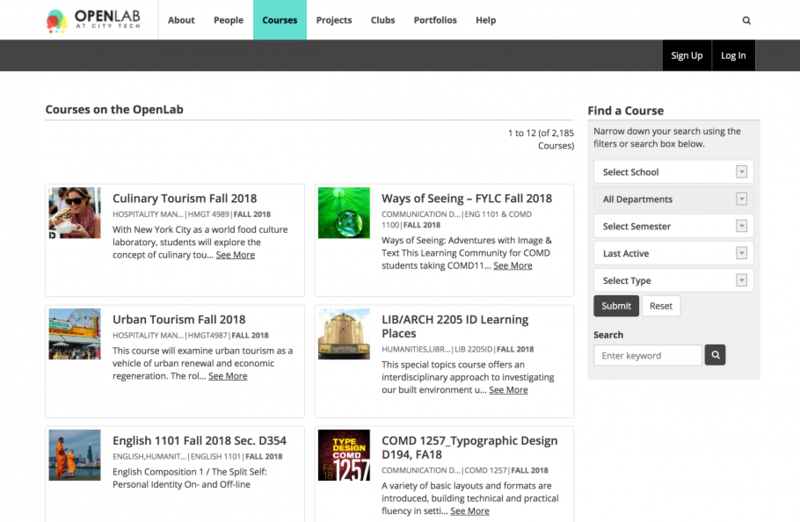 Thousands of students at City Tech have used the OpenLab to create their portfolios; it also hosts teaching and professional portfolios for faculty and staff. 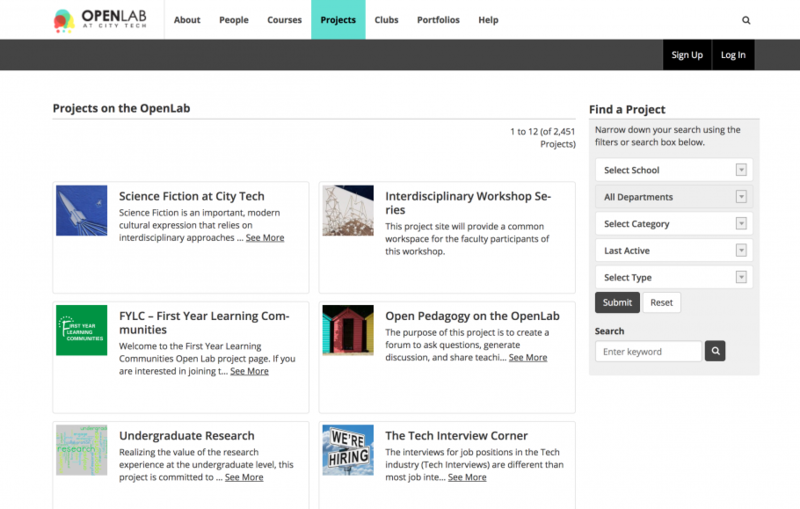 Visit City Tech’s OpenLab and check out their tour, along with their archive of work that’s been showcased in the spotlight, for more examples.